Evening folks…another stroll through the woods yesterday afternoon with some friends and our dogs. When Kathy yells out 'Dale come check this out', of course I had just past this little critter…but Kathy and her eagle eyes! The red eft salamander (Eastern newt) we viewed wandering the forest floor, lived in a body of water for the first few months of its life. 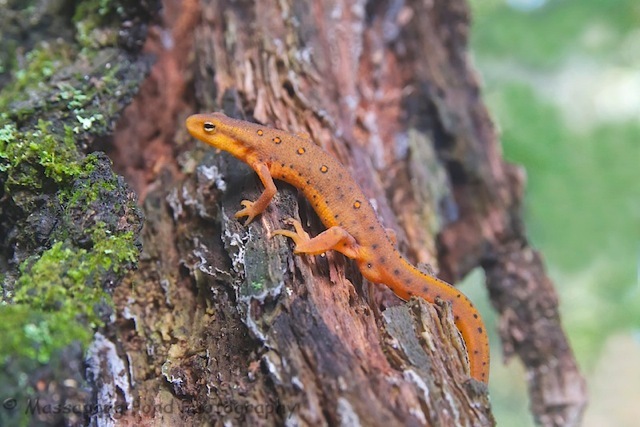 Eastern newts have three stages of life: the aquatic lava or tadpole, the red eft or terrestrial juvenile stage, and the aquatic adult. After shedding its gills and developing lungs, the young salamander crawls out of the water and turns an orangish-red with darker red spots outlined in black. After two or three years, the eft finds a pond and transforms into the aquatic adult and is called an Eastern newts. The adult's skin is olive green, but retains the eft's characteristic outlined red spots. They have a lifespan of 12 to 15 years in the wild, and may grow to 5 inches in length.